This upholstered office task chair features contemporary contoured curves and large, thickly padded seat and backrest cushions. Other features include stain-resistant commercial grade upholstery, pneumatic seat height adjustment, knee tilt mechanism that dips down instead of rocking back to help keep feet more level to the floor, tilt lock with tilt tension adjustment, padded 5-way adjustable arms, molded polypropylene outer back shell and a sturdy five star base with standard dual wheel casters. Meets or exceeds ANSI/BIFMA safety standards. Dimensions: Seat Size: 20"W x 20"D. Back Size: 20"W x 22"H. Seat Height Adjustment: 17 - 21"H. Overall: 44"H x 26"W x 25"D. Limited lifetime warranty from OFM. 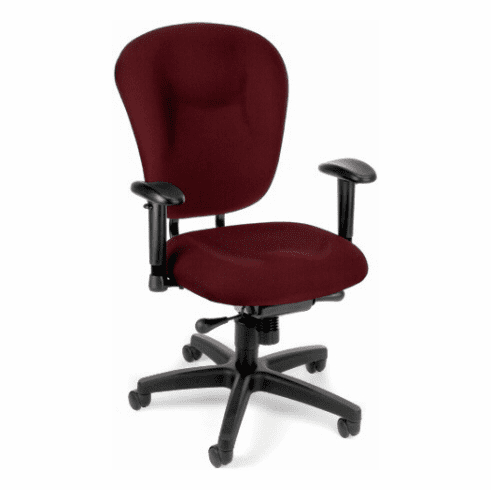 These office task chairs normally ship within 1-2 business days from our NC or AZ warehouse.